Mary J Blige has made her covers of Led Zeppelin's Stairway To Heaven and Whole Lotta Love available as downloads on iTunes. Last month, MusicRadar told you that Blige had recorded her version of Stairway, produced by music executive Ron Fair and Tal Herzberg, utilizing the guitar team of Steve Vai and Orianthi, along with American Idol judge Randy Jackson on bass and Blink-182 drummer Travis Barker. Meanwhile, Blige's take on Whole Lotta Love was produced by Fair and RedOne. No other credits have been supplied, and from the sounds of it, actual musicians weren't in the studio for this track. Curious? Check out Stairway To Heaven and then give Whole Lotta Love a spin. 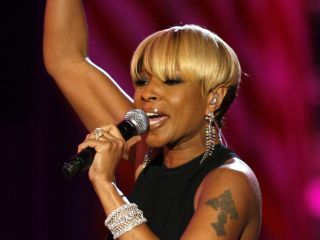 Blige's Zeppelin covers, which have drawn equal parts praise and derision, were included on the UK version of her 2009 album Stronger With Each Tear. Yesterday, however, both songs were listed on iTunes in the US as singles. "I am a Led Zeppelin fan," Blige said. "I've listened to their music since I was a child, and it's always moved me, especially Stairway To Heaven. "I loved soft rock as a child. I'm full of this stuff, naturally." We admit, we're still trying to figure out how Blige can classify Led Zeppelin as 'soft rock.' In any event, MusicRadar has an alternate Whole Lotta Love to rock your bells. This is a particular favorite of our own Chris Vinnicombe. May we present Goldbug's waaaaaay over-the-top 1996 remake, which actually hit No. 3 on the UK singles chart.